It should not come as a surprise that police officers sometimes have to use force to apprehend, subdue or hand cuff a suspect or a citizen who is breaking the law. It is their job to keep the public safe, right? So when things get heated and suspects are using force against the police officers, it is up to the officers to use their best judgement to use whatever force is necessary to get the suspect to be subdued enough to stop resisting arrest (also known as compliance). But when does that force become excessive – what is excessive force? Excessive force is simply defined as using force that is not reasonable or is excessive given the circumstances of the situation. Many police officers learn that force should be applied in incremental steps, like starting with respectful requests and elevating as necessary. It’s also a common practice to use the same amount of force towards a suspect that the suspect is using towards the officer. Excessive force can occur almost anytime and anywhere; when police are trying to apprehend a suspect,during crowd control at an event, or just trying to keep the peace during a protest. The situation itself does not have to be violent in nature for police to employ excessive force. Excessive force can appear in a number of ways. The force can include tackling, punching, kicking, unnecessary use of a taser, strikes with a firearm or baton, or even handcuffs that are too tight. Some more questionable tactics, like a choke hold, have even been banned in some areas to prevent excessive force. Force becomes excessive and illegal when an officer continues the force after the suspect has complied, that is been subdued and arrested. Because of the nature of a police officer’s job and the safety of the general public, it can be hard or confusing to determine if excessive force was used. However it’s important to remember that excessive force is illegal and any officers using such force should be held accountable for their actions. Excessive force is just one example of a person in power abusing his or her position of authority. Abuse of power is not always physical like with excessive force; it can be verbal and shown through a series of actions, as in workplace discrimination or harassment. It’s important to know and demand your civil rights, and know who to call when those rights have been violated. Civil Rights Litigation Group is the people’s rights law firm dedicated to representing citizens in Denver and across Colorado. In fact, we work for the people and make it a point not to represent government entities or corporations. 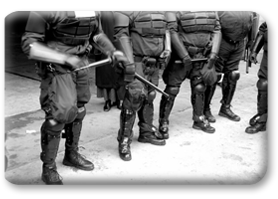 We help you stand up for your rights against excessive force, discrimination, and other constitutional issues. If your rights have been violated, particularly by someone abusing his or her power, call us today: (720) 515-6165. We’ll support your fight for the respect you deserve!